Do you need also a blueprint for the digital transformation of your company this year? Dragon1 will help you out. Business Blueprinting methodology is showing and measuring the impact of changes made to business processes, information systems and IT infrastructures with the goal of increasing returns from Business and IT investments. In the shortest time possible (4 weeks' time) you will guaranteed have a blueprint that you can use to support your strategic decision making and to guide your projects. This because the blueprint supports you in seeing hidden patterns and opportunities. You will make decisions like you have never done before! And all this will enable you to do a better digital transformation and to compete better in the end. In this way you will most productive. For instance, take a look at the blueprint here below (it is in the Dutch language and anonymized). The blueprint below was created by an insurance company on Dragon1. At the insurance company many IT systems, over 50, were performing their own duty: processing incoming insurance data, applying hardcoded business rules and using pretty much only their own reference data, like client information. The organization wanted to get rid of the hard-coded business rules, to deduplicate functionality and integrate the systems more so they would reuse centralized client data instead of copying and storing it themselves. Because for years there was no complete overview of the application landscape and data landscape and no overall data model. New systems were bought or modules were switched, but nothing was integrated. If a client would remarry or relocate it could be easily he or she had various client IDs and his insurance files could not be linked easily together. And of course, that brings a problem when invoicing and fighting fraud. By creating a blueprint by importing data from other systems, the organization in weeks' time gained insights and overviews of the whole application landscape, data landscape and overall data model they never had before. This enabled them to see patterns and opportunities to integrate systems, to appoint databases as the source for certain business objects and to have modules of applications switch of in order to deduplicate functionality. Every time an application, interface or database was to be changed, first the impact of the change was viewed on this blueprint and next detailed into a separate diagram. The result was that the quality of data and speed of processing had increased. Now when a business rule needs to be changed, no longer the systems need to be re-coded. The business rules can be changed in a repository. Mistakes made in client data are also mitigated. If a client has several insurances under different names (like maiden name and married name) they can be linked much better. Or if some have different historical addresses, their dossiers can be connected much easier in order to prevent fraud. Creating a business blueprint brings up surprising things. Like when you import data and generate a diagram from it, the diagram looks different then when it would be created by hand. For instance, people tend to draw a situation more positive without certain problems. Imagine a financial account making use of a spreadsheet. When generating a diagram based on a data file, the problems are shown better. And also data changes continuously. The moment you have a diagram of model ready, the data has changed. So if you only need to import the top update your models and diagram centrally is much quicker and fail to save then having to go over tens of PowerPoint or Visio files and removing all the wrong versions from stakeholders. 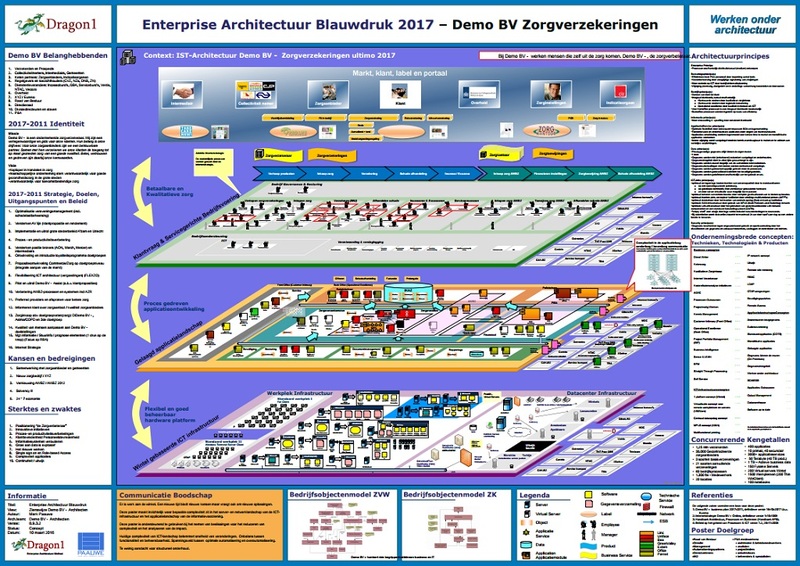 Creating a blueprint like this, really shows the benefit of working with an Enterprise Architecture Tool. This visualization shows strategy on the left, four architecture layers in the middle (market & client, business processes, applications / systems and technology / infrastructure) and transformation (projects and deliverables) on the right. Now suppose something changes in the strategy, because underneath there is a model, the affected or impact data in the middle will be colored (depending on the setup) in red. You can very easily keep your blueprint up-to-date, by uploading and importing delta's from your excel sheets (XLS) or csv file. On Dragon1 we have built a specialized import module for that. How to start with Business Blueprinting? You only need to purchase a Dragon1 PRO license here, and an English visualization template, excel sheet and example will be made available in your account. We are at your service with support via phone, email or skype to guide you through the steps. If you have any questions or want to discuss your needs, you can contact us anytime via info@dragon1.com or via +31 317 411 341.